I want to talk about a most important book: Anatomy of an Epidemic, by Robert Whitaker. This book is vital to: people with anxiety, depression, schizophrenia, bipolar disorder, ADD or ADHD, and autistic spectrum disorder. Also, parents, loved ones, teachers and therapists of people with any of these conditions need to assimilate the critical information presented in this book. Lastly, prescribing physicians need to be made aware of the deeply troubling long term effects of most psychiatric drugs commonly used today. When reading an important book, I keep a pen at my side, highlight important points for future reference, and dog-ear those pages. If you look at my copy of Anatomy, you’ll notice that more than half of the pages are marked, and a second type of dog-ear abounds, where a very important point gets the page folded in half. Thus, it’s a huge task to try and summarize or convey anything close to the full impact of his monumental work. I’ll focus on the most critical points, but this won’t be short. Mr. Whitaker has gone to great lengths to investigate and document the perverse effects of psychoactive drugs worldwide. His book is very thoroughly documented, not only with studies, but with examples of hospitals and clinics around the world which have been able to greatly improve outcomes in patients whose psychiatric conditions are treated with non-drug approaches. Tragically, the number of people in the US afflicted with anxiety, depression, schizophrenia, bipolar disorder, ADD/ADHD, ODD and violent behaviors has drastically increased since the introduction of medications specifically designed to treat these conditions. This book documents in great depth how study after study has demonstrated that the drugs developed to treat these problems have decreased the likelihood of recovery and the long term functional outcomes in patient treated, as compared to those who receive no pharmaceutical treatment. In other words, the treatment of these conditions with medications has overall worsened their prognosis, and, in addition, has greatly increased the number of people afflicted with some of these disorders—in particular, bipolar disorder, depression, anxiety and violent conditions. For example, the number of American children younger than 18 receiving SSI disability for serious mental illness has risen from 16000 in 1987 to 560,000 in 2007, an increase of more than 3500 %. US children receive more than three times as much stimulant medication as children in the rest of the world all combined. And heinous, catastrophic violence is haunting our schools and public places, and many more mass murders are occurring in the US than in the rest of the world. Something is going terribly wrong. Before looking at some of the data, let’s examine the criteria for making a psychiatric diagnosis today vs 100 years ago. One might say, “well, we have SPECT scans, functional MRI’s, QEEG’s, neurotransmitter testing, sensitive biochemical testing for endocrine or metabolic disorders,” which is true. But these tools are rarely employed in evaluating a patient with a behavioral or mood or attention problem. Today the diagnosis of depression or anxiety or schizophrenia is arrived at in the same way as a century ago: by history, without the use of brain studies or metabolic testing to confirm. Are we better at taking histories than in the past?? Given the few minutes allotted to office visits in our current medical paradigm, perhaps diagnoses are arrived at too quickly, without getting a full picture. In fact, HIPPA impairs a physician’s ability to get ancillary information from family and loved ones about a person’s mental state, without their consent. If we accept the proposition that there is a problem of over-diagnosis, or too hasty resort to the prescription pad, it is all the more important to look at the effects on functionality and outcome of a person who receives a psychiatric diagnosis and a prescription to treat the diagnosis. Ultimately, this is what Anatomy is about, and it’s important to realize that this book is recounting the findings of evidence-based studies, which are considered the gold standard for decision making in medicine. Consider schizophrenia, long recognized as the most severe of psychiatric illnesses, for which antipsychotic drugs were heralded as a huge breakthrough 60 + years ago. Prior to the introduction of these drugs, the majority of people diagnosed with schizophrenia who received appropriate supportive therapy, would eventually return to work, relationships and successful life without recurrence. While the use of older and newer antipsychotic drugs (from Thorazine to Risperdal) did reduce hospitalization times and produce quicker improvements, it turns out that only a very small percentage of people so treated are able to discontinue their medications or return to productive life. These findings are presented in a number of studies done under auspices of the WHO (World Health Organization), NIMH (National Institutes of Mental Health), and prestigious medical schools. One long term prospective study funded by NIMH demonstrated that functional outcome was much higher for people with schizophrenia who did not receive medications than for people with bipolar disorder treated with medications. This was seen, despite the fact that bipolar disorder is considered to have a much better prognosis for returning to productive life than schizophrenia. The same group followed 64 schizophrenic patients over 15 years, comparing those treated initially with or without drugs. At 7 years they found 10% of the medicated patients recovered, dropping to 5 % at 15 years, while 40% of the unmedicated patients were recovered at both 7 and 15 years follow-up. Yet another study from UCSF School of Medicine randomized 80 hospitalized schizophrenic patients to either receive drugs or placebo, and followed them for 3 years. The average hospital stay for both groups was the same, but at three year follow-up, the placebo-treated patients were rated at half the severity scale of the drug-treated patients, and their re-hospitalization rate was 8% vs 73% for the drug treated patients. In addition, several studies have shown that the life span of people with schizophrenia has dropped by as much as 20 years since the introduction of neuroleptic drugs to their treatment. Similar findings are reported for depression, with terms such as “chronification” of depression and “malignant” and “unresponsive” depression attributed to changes provoked by both the old and the new antidepressant drugs. Whereas in the years prior to introduction of these drugs into psychiatry, depression was very uncommon, with about 1 in 4000 Americans hospitalized for depression in 1955. Prior to that time, it was found that more than 50 % of people diagnosed with depression had a single episode and recovered without recurrences. It was stated in 1974 by the head of the NIMH depression section, that rates of spontaneous remission from depression were so high as to make it challenging to identify the effect of a therapy such as medications or therapy. Then, in 1999 the American Psychiatric Association’s Textbook of Psychiatry stated: “…depression is a highly recurrent and pernicious disorder.” In 2001 a NIMH backed study of depression responses showed that 24% of patients treated with St. John’s Wort herbal responded, vs 25 % of those treated with Zoloft, compared to 32% treated with placebo. In 2004, a prospective year-long study from Texas Southwestern Medical Center showed that only 6 % of depressed patients treated with medications and a full spectrum of psychosocial supports fully recovered. On the other hand a WHO study of 740 people with depression found that 42% of those who were not treated were well after one year, vs 32% of those treated with antidepressants. Finally, a study of 547 people with depression in the US found that those who were treated with drugs were seven times more likely to become incapacitated. According to the NIMH, 15 million Americans now suffer with depression, and the John Hopkins School of Public Health found in 2008 that nine million of us are severely impaired by depression. Where does it end? Regarding the theory of chemical imbalances such as the serotonin depletion theory of depression, recites study after study which refute the simplistic theory that people with depression have low serotonin levels. This includes studies of serotonin levels in spinal fluid of depressed vs non-depressed people, which show no significant difference. He elaborates on the finding that drugs which alter the levels of neurotransmitters will change the responsiveness of receptors to these transmitters. If a drug increases the concentration of a neurotransmitter at the synapse (where neurotransmitters act), the receptor will down-regulate, and if the drug reduces the concentration of the neurotransmitter at the synapse, the receptor will increase sensitivity. This leads to dependencies on the medications and potentially severe withdrawal problems if they are removed, as the alterations in receptor sensitivity caused by the body’s adaptive response to the drug, will take time to adjust to the drug free state. 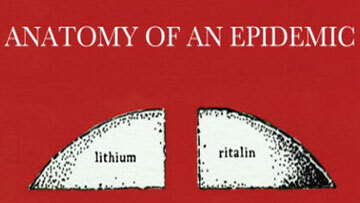 In the case of SRI drugs, the pat statement we hear when a person goes into painful withdrawal upon stopping the drug is “Your reaction to stopping the drug demonstrates that you have a serotonin deficiency and must stay on the drug,” rather than “you are in a painful withdrawal because your receptors have been down regulated by excess serotonin in your synapses.” This is a perfect scenario for a drug company, to produce a drug which makes people feel temporarily better, but much worse if they try to stop it, so that they must take the drug indefinitely, and often need to raise the dose because of reduced receptor sensitivity. These adaptive changes in receptor sensitivity occur with SRI’s, antipsychotics (from Thorazine to Risperdal, the old and the new), stimulants (from Ritalin to Strattera), and anxiety meds (from Valium to Klonopin). Beyond withdrawal problems, hyper-responsiveness to fluctuations in neurotransmitters caused by stress, diet, exercise, sleep disruption, toxins, etc. can result in rapid shifts in mood, self-regulation, impulsivity, self-control, sleep, etc. Such hyper-responsiveness may be an aspect of the underlying illness, and may be aggravated by drug treatments. Also, such changes in receptor response could lead to symptoms which appear to be a new diagnosis, such as bipolar disorder, anxiety, depression, or ADD/ADHD. A point of critical concern is the entry of these drugs into the world of children, whose brain architecture and neurochemistry are rapidly shifting and developing in response to neurotransmitters and other influences. As a result, the brain of a child is much more vulnerable to neurotransmitter perturbations than the brain of an adult. Such perturbation might lead to symptoms of bipolar disorder, with rapidly shifting mood, or of ADHD, with impulsivity, distractibility and hyperactivity. Or they might lead to simple depression related to disturbed sleep patterns, apathy, down regulated dopamine pathways, altered adrenal and cortisol output, etc. Or they might lead to oppositional, behavioral, or violent conditions. All of these conditions are now commonly diagnosed in American children, leading to use of prescription drugs to treat the diagnosis. In the case of bipolar disorder, it was unheard of in children prior to the advent of stimulant and antidepressant therapies. In 1945 and 1950, literature reviews showed no cases in children under 13, and only 2 cases in children over 13. After the advent of Ritalin and the SRI drugs, the incidence of bipolar disorder rose to somewhere between 1 and 2% of children. One research team reported that 20 % of children treated with Ritalin eventually became bipolar, leading them to suggest use of this drug to “unmask” the disease (rather than identifying the drug as cause), and a study of Prozac in childhood “depression” (quotes mine) reported that 6 % of treated children vs 0% of placebo children developed mania. In the past 50 years, bipolar disorder has risen from an unheard of condition to a diagnosis impacting at least 900,000 children in America. These children are treated most often with drug cocktails, and one may predict that their outcome will be similar to what we now see in adults, with chronic, unrelenting cycling, and eventual cognitive impairments (memory, decision making, fluency, executive function) as severe as seen in schizophrenic patients (data from several reported studies in Anatomy). Strengthening the case that bipolar disorder is drug induced is the epidemiology in adults, wherein prior to 1950 it was diagnosed in around one in 10,000 adults, and is now diagnosed in at least one in 40 adults. Regarding stimulant therapy for ADD/ADHD, outcome studies through the NIMH showed worsening of their main ADHD symptoms and growth retardation in children treated for up to three years, with further problems at six years, including increased delinquency, oppositional/defiant symptoms, aggravated hyperactivity and aggravated functionality globally. While demonstrating short term improvements in classroom behavior, the long term studies, in addition to animal studies, raise great concerns that these drugs will contribute mightily to the mental health crisis children are facing. Beyond these concerns, these drugs can cause psychosis, depression, hypertension, cardiac death, obsessive compulsive disorder, anxiety, and other serious side effects. The list goes on. Antidepressants are now prescribed for more than 1 in 40 children in America, despite the fact that they can have fatal consequences, including suicide and homicidal mania. In 2004, the prestigious journal Lancet reported in an editorial that “The story of research into selective serotonin reuptake inhibitor use in childhood depression is one of confusion, manipulation and institutional failure.” In another issue, they described these medications as “ineffective and harmful in children.” A retrospective review by Massachusetts General physicians found that 22% of 82 children treated with SRI’s had an adverse psychiatric event, including 10% developing psychotic symptoms and 6 % developing mania. I want to return to my earlier description of how psychiatric diagnoses are made—not by imaging or laboratory testing, but by what the clinician can derive from talking to the patient (and parents if a minor), and observing the person. In effect, the diagnosis is an opinion, and it may not be informed by the research findings detailed in this book, findings which are rigorous, evidence based, and developed by researchers from NIMH and top academic institutions. But the FDA fails to provide adequate oversight of drug advertising, physician education, egregious conflicts of interest (most notable in psychiatry, where researchers are paid by drug companies to promote the drugs they’re studying), and even quality of evidence used to bring a drug to market and convince doctors and the public to use it. It is buyer beware in our country, and we need to become well informed about psychiatric medications, particularly in children. The crisis we’re seeing in children’s mental health, including autism, is multifactorial, as I have discussed in other presentations. But the research presented in this book is vital, as we look at a society where more than one in six of our children has a condition which makes them a likely candidate for psychiatric drug therapy. It is a shocking eye-opener, but it will help you to make good decisions on behalf of your child (and often yourselves, you parents). In closing, I want to share my own concern that I consulted with many families whose children are taking various psychiatric drugs. When a child comes to me on psych meds, I don’t withdraw the drugs immediately, as I can be assured of a negative response in most cases. It is very difficult to remove a medication which has profound effects in the nervous system, perturbations in the neurochemistry and neurotransmitters. And so changes need to be made very gradually, while always working to improve the child’s health and vitality, their milieu and support system, the stresses of school and illness, their sleep and stools, diet and exercise, contact with nature and dirt, and parsimonious exposure to electronic media. With all supports in place, removing the medication becomes more possible, and successful management of the issues without medication, more likely. I want to acknowledge that I have prescribed psychoactive drugs for a good many patients with autism and behavioral issues, with violent or self-injurious conditions, or with severe anxiety. It has always been with great reluctance that I do so, and being now better informed as a result of studying Whitaker’s work, I shall be all the more vigilant and cautious about using these drugs. It’s a long book, some of it very engaging and dramatic. Some of it is slow reading, and my suggestion is that you read the chapters related to your or your child’s condition/diagnosis, and skim the general sections for points of particular interest. Also, I suggest that all each of you read the chapter on tallying up the profits, which documents a key aspect of the problem—the astronomical payments made by pharmaceutical companies to key thought leaders in psychiatry—professors, researchers and authors of textbooks, who receive these kickbacks for promoting drugs they’ve studied. This conflict of interest has always been a concern in science, but somehow flies under the radar in psychiatry.